I have just returned from Japan and really enjoyed my time there with the Family Yoga team in Tokyo and walking in the Hakone region. It was a wonderful experience and I found the people were very welcoming and warm. The Japanese people we met were very much into naturally maintaining stability and calmness and seeing the most important way of life for human beings is the life of love. They see the nature of love is to cooperate with the correct way of living. The pledge of Family Yoga is to maintain the grace of nature to cooperate with ourselves, with others and with all life. Our Australian group was able to stay in the village of Yanaka within the greater Tokyo-Yokohama metropolitan area which contains a population approaching 40 million people. This is arguably the most populous metropolitan area in the world, however many narrow streets, religious shrines, parks and community facilities and the subway system has meant Yanaka has been able to maintain its traditional feel. The transport system in Tokyo is efficient with a labyrinth subway system, trains and buses with car traffic relatively light. Public transport is cheap, clean, fast and very efficient and on most subway lines you only wait a couple of minutes for the next train arrival. 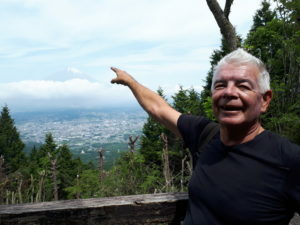 Only a couple of hours away by fast train is Mount Fuji and Hakone the Japanese version of Switzerland where I loved to walk in the mountains, along side clear lakes and rivers and in the forests breathing clean air. This is the place honeymooners go and people escape the city for the country enjoying hot mineral springs and walks for their health and wellbeing. I see the Sunshine Coast as the equivalent of the Hakone Region in providing that escape for health and wellbeing and how importance it is not becoming part of metropolitan greater Brisbane. The people of the Sunshine Coast are also welcoming and warm with a lifestyle and natural assets that ensures we are different and we love it.